I am a geochemist researching climate change and the carbon cycle. Paleoclimate: I develop and refine geochemical proxies to understand the history of the past environment. These include radioactive isotopes to study rates of processes such as ocean circulation, and stable-isotopes to understand variables such as past rainfall or weathering. I also construct timescales for these proxy-records, and I run a leading U-series-chronology lab dating the history of sea level and of high-resolution climate records in stalagmites. I collaborate with ocean modellers to better understand and apply paleoclimate proxies, particularly those based on U-series nuclides. The unifying goal of this work is to use paleoclimate to better understand the processes controlling climate change. A particular recent interest in this area is to understand the influence of seasonality through very high resolution paleoclimate records. This complements long-standing interests in the response of the climate system at orbital and millennial timescales. 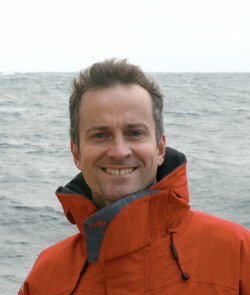 Ocean chemistry: My interest in ocean chemistry links to paleoclimate because it provides critical information about the proxies used for paleoclimate, and also because the oceans play such a critical role in driving climate via the carbon cycle. By making appropriate measurements in the water column and underlying core-top sediments, I assess the calibration, limitations and uncertainty on paleoproxies such as 230Th normalization, Si isotopes, and Mg/Ca. I also research the iron cycle in the oceans – so important for its role as a limiting nutrient – assessing the fluxes of Fe into the ocean from atmosphere, land and sediment. More recently, though collaboration with ocean modellers at Oxford, I have started to pursue work on the inorganic carbon system in the oceans, including the sensitivity of future ocean carbon uptake and the appropriateness of some ocean geoengineeering schemes.